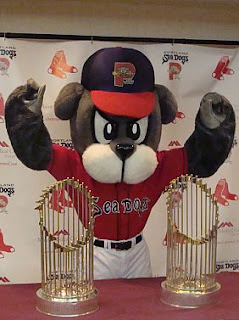 The Portland Sea Dogs Hot Stove Dinner for 2010 has already come and gone, but the memories remain. If you are looking for exclusive coverage, well, you've got it. We'll start off w/ video of the voice of the Portland Sea Dogs Mike Antonellies speaking with Boston Red Sox Director of Player Development Mike Hazen. Below we have audio of Jeff's interview with outfielder Josh Reddick. Josh talks about the first day he got called up to the big leagues, baseball, and his 'stache and mohawk. Arnie Beyeler is in his 4th season as Sea Dogs manager. He talks about his off-season, returning to Portland, and make a solid swipe at Jeff and myself about our appetites when talking about his post-game meals. Good stuff from the skipper.